These are the words of Khabat Mohammadi, an Iranian Kurdish youth who lives with another 450 asylum-seekers in a camp in Iraq on the border of Syria called al-Waleed. This camp, which is near the city of al-Rotbah in southern Iraq, contains mostly Arabs from Ahwaz, Iranian Kurds, and Palestinians. There are 173 Kurds in this camp, 90 Arabs of Ahwaz, and the rest are Palestinians. These asylum-seekers say that they have been told that their camp should be torn down along with Camp Ashraf, which belongs to [Iranian political party] Mujaheddin-e Khalgh. RADIO ZAMANEH: From which time, and for what reason have you started your strike and sit-in? KHABAT MOHAMMADI: I want to point out the fact that the day before we were transferred to al-Waleed camp, which was almost 2 years ago, where we were stationed between the borders of Jordan and Iraq, the head of the UN in Iraq, Mr. Daniel Endres, promised the refugees that after their transfer to al-Waleed, their problems would be resolved in a number of stages. We were transferred to al-Waleed on 5 August 2009. There were 1,500 Palestinian asylum-seekers in this camp then. After we arrived, another group of refugees, Ahwazi Arabs, were transferred to that camp, and the population of the camp reached around 2000 people. From all the promises that they had given to the asylum-seekers, only one was fulfilled, and that was that they came and visited us once again. Now, after a year and a half later, they have not given any answer to any of the asylum-seekers, and as we have been informed recently, they want to close down the al-Waleed camp. 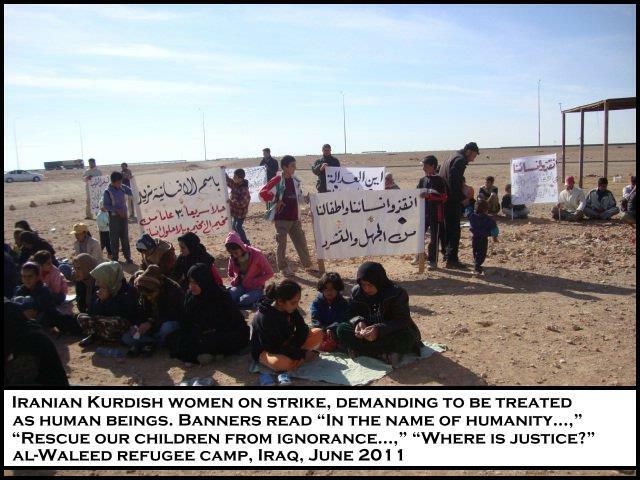 For this reason, we, the Kurds in the al-Waleed camp, have been involved in a sit-in for the past month, in front of the UNHCR office in the camp. RADIO ZAMANEH: How did you get the information that al-Waleed camp is going to be closed down? KHABAT MOHAMMADI: A few months before our sit-in, Mr. Mohammad Khaled, the UNHCR representative in western Iraq, said that they have received an official letter from the Iraqi government stating that this camp is to be closed down at the end of July. In the past few days, Mr. Hassan Tamimi, legal counsel of the UNHCR, has visited al-Waleed camp and officially announced that their organization has been formally informed by the Interior Ministry that the government of Iraq intends to close down two camps: one is Camp Ashraf and the other is al-Waleed. Mr. Tamimi also said that UNHCR has asked the government of Iraq not to close this camp yet, and that more time be given to this issue. He said it is not clear to them that the timetable given is going to be extended, or if they are still going to close down the camp at the end of July. This concerns us, and Hassan Tamimi emphasized that the asylum-seekers should prepare themselves for any eventuality. RADIO ZAMANEH: When did you leave, and why did you leave Iran? KHABAT MOHAMMADI: 8 years of war between Iran and Iraq, and the Islamic Republic’s offensive on Kurdistan resulted in thousands of Iranian Kurds being driven from their homes. The majority of them took refuge in Iraqi Kurdistan. Later, the government forcibly removed them to al-Tash in Ramadi City, which is the capital of Anbar Province. These asylum-seekers, until the offensive of American forces against Iraq and the downfall of Saddam Hussein, lived there in al-Tash. Later, a number of them were assassinated, some of them openly, by extremist groups like al-Qaida. A number of them were killed in more covert operations, probably by agents of the Islamic Republic. After these events, a number of these people moved to the borders of Jordan or Iraqi Kurdistan. We too went to move to the Jordanian border, but the Jordanian government did not allow us to enter their territory. We were there until 2009, when we were moved to al-Waleed by the Iraqi Interior Ministry. RADIO ZAMANEH: What kind of welfare facilities do you have in al-Waleed camp? KHABAT MOHAMMADI: The al-Waleed camp is in the desert, and the people in it have been living under tents for 7 years [the 7 years includes the years at the Jordan border]. The nearest city is al-Rotbah, which is 2 hours from al-Waleed by car. Children were denied school when we were on the border of Jordan and the school that exists in the camp does not accept them. In this school, lectures are in Arabic, and a very limited number of children can be enrolled. Of course, this school does not give any sort of official papers, and the majority of those who are a little bit older have been totally denied education. RADIO ZAMANEH: Is it true that Iraqi forces have attacked your camp? KHABAT MOHAMMADI: On 25th of May, 2 Kurdish women asylum-seekers went on hunger strike, and on the 20th of June, World Refugee Day, to protest against the silence of the UN and the pressure from the Iraqi government, we closed the gates of the camp and did not allow the car of the UN official to enter the camp. We wanted to tell them that 50 days of strike and sit-in by Kurds in this desert have passed, and you have not given any reply. The doctor of the camp had said that these two women cannot continue their hunger strike. The UN representative, instead of solving their problem, brought in a number of Iraqi police forces and intended to finish, by force, these two womens’ hunger strikes, and the asylum-seekers’ strike and sit-in. They forcibly moved these two women by ambulance to the city of al-Rotbah and forced them to finish their strike. After that, the people of the camp were physically attacked by the government forces and verbally abused. RADIO ZAMANEH: Why haven’t you been removed to a third country yet? KHABAT MOHAMMADI: Previously, UNHCR officials made excuses by saying that the camp you are living in is not an official camp and the UNHCR has no access to this camp [referring to the camp at the Jordanian border]. After our transfer to al-Waleed, they told us that they have talked to different countries and asked them to accept Kurdish asylum-seekers. Until now, there has been no specific reason given to us Kurds as to why we are still in this camp. Fortunately, 99 percent of all Palestinians have been transferred to the United States, and only 200 of them remain here. In relation to the situation of these asylum-seekers, I seek out the Human Rights Commission of the Iraqi Parliament and have a short conversation with Osama Jamil, member of this commission. RADIO ZAMANEH: How probable is closure of the asylum-seekers’ camp al-Waleed? If this camp is closed, what happens to the inhabitants of that camp? OSAMA JAMIL: The government of Iraq has the intention to solve the problems of all Iranian and Turkish citizens inside Iraq. If the al-Waleed camp is closed, definitely there is going to be a humanitarian condition, and their needs will be addressed. They are not going to be forcefully returned to their countries and they are not going to be dealt with inhumanely. Because neither the Iraqi Parliament nor other Iraqi institutions can accept this. At the end, they are going to be transferred either to the country they wish, or if they want to stay in Iraq, the Iraqi government will consider the case, and they can stay in Iraq until there are changes in their own countries. RADIO ZAMANEH: How connected is the closure of al-Waleed camp to that of Camp Ashraf? OSAMA JAMIL: These are more political statements, and there has not been a final decision in these regards – to close these camps is not easy. The government of Iraq is not narrow-minded. To emphasize on the humanitarian dimension of this is the question, not the political dimension. From the humanitarian point of view, it is necessary to deal with these issues in a way that does not contradict the principles and fundamentals of human rights. RADIO ZAMANEH: In your opinion, why have these people not been resettled to third countries? OSAMA JAMIL: This issue, because of the importance attached to it, is being studied in Iraqi Parliament. The Iraqi Parliament too certainly will consider the humanitarian dimension and is not going to make a decision that hurts individuals. I think that these camps are not going to be closed, because in that case, pressure by the international humanitarian institutions and the international community would be felt. We need to find a solution that pleases members of these camps. RADIO ZAMANEH: In your position as a member of the Human Rights Commission of the Iraqi Parliament, what do you know about these asylum-seekers’ strike? OSAMA JAMIL: People of Iraq, and the government, are neglecting these camps somehow. It is natural if all the people of Iraq, or political societies are not aware of these issues. People of Iraq say that members of Mujaheddin-e Khalgh participated in suppression of people of Kurdistan and other places in Iraq in 1991. This has led to a negative attitude towards Mujaheddin, and they ignore events concerning them. There is evidence and reasons that they did indeed participate in the suppression of demonstrations of 1991 in Kurdistan, and this is regrettable. That is why, if there is negligence towards incidents concerning them, you can blame it on their deeds and attitudes towards Iraqi people in 1991. RADIO ZAMANEH: But al-Waleed Camp has not participated in the suppression of Iraqi people. OSAMA JAMIL: Al-Waleed is different from Camp Ashraf. I have received their letter recently and I have sent that letter to the Human Rights Commission of the Parliament, and this is going to be studied in the coming days. The Speaker of the Parliament will discuss this with the President of Iraq to find a solution in favor of these people. RADIO ZAMANEH: In your opinion, what kind of solution can we find for this problem? OSAMA JAMIL: One of the solutions is that a representative should visit al-Waleed camp to hear their demands, to know if they want to be transferred to a 3rd country or stay in Iraqi Kurdistan. RADIO ZAMANEH: Residents of the camp say that they have been attacked by government forces recently. Do you have any information about this? OSAMA JAMIL: I do not have any information about this, but I have heard about it from them. In the meeting of the Human Rights Commission of the Parliament, we will put this issue on the table. We will call those who have attacked to the Parliament to explain themselves. این سخنان خبات محمدی، جوان کرد ایرانی است که همرا با ۴۵۰ پناهجوی دیگر در مرزهای سوریه و عراق در اردوگاهی به نام الو…لید زندگی می‌کنند. این اردوگاه که در نزدیکی شهر الرطبه در جنوب عراق واقع شده است و بیشتر ساکنان آن را عرب‌های اهواز، کردهای ایران و فلسطینی‌ها تشکیل می‌دهند. کردها در این اردوگاه ۱۷۳ نفر، عرب‌های اهواز ۹۰ نفر و بقیه فلسطینی هستند. این پناهجویان می‌گویند اخیراً به آنان گفته شده است که اردوگاه‌شان همزمان با اردوگاه اشرف سازمان مجاهدین خلق باید تعطیل شود. با هدف کسب اطلاعات پیرامون وضعیت این پناهجویان با دفتر کمیساریای پناهجویان سازمان ملل در عمان تماس می‌گیرم، ولی کسی حاضر به پاسخگویی در این زمینه نیست. پناهجویان می‌گویند بخشی از کارهای اداری‌شان در آن دفتر انجام می‌گیرد که طی سال‌های اخیر به دلیل حملات القاعده از عراق به عمان منتقل شده است. دکتر محمود عثمان یکی از اعضای مجلس عراق در گفت‌وگو با زمانه این احتمال را بعید نمی‌داند که جمهوری اسلامی در بسته شدن اردوگاه الولید نقش داشته باشد. اسامه جمیل، عضو هیئت حقوق بشر مجلس عراق بر این باور است که مطرح کردن تعطیلی اردوگاه الولید همزمان با اردوگاه اشرف، بیشتر اظهار نظر سیاسی است و حکومت عراق حقوق انسانی این پناهجویان را رعایت می‌کند. از سوی دیگر اخباری مبنی بر حمله نیروهای دولتی عراق به این اردوگاه منتشر شده است. با خبات محمدی در این زمینه گفت‌وگویی کرده‌ام که می‌خوانید. خبات محمدی: می‌خواهم به این نکته اشاره کنم که یک روز قبل از این‌که به اردوگاه الولید منتقل شویم، یعنی چهارسال پیش، آن موقع که در میان مرزهای اردن و عراق بودیم، رئیس کل یو.ان در عراق آقای دانیل آندرس به پناهجویان قول داد که پس از انتقال‌شان به اردوگاه الولید طی چند مرحله مشکلات‌شان را حل خواهد کرد. در پنجم اوت ۲۰۰۹ به اردوگاه الولید منتقل شدیم. در این اردوگاه قبلاً ۱۵۰۰ پناهجوی فلسطینی سکونت داشتند. پس از ما دسته‌ای دیگر از پناهجویان عرب‌های اهواز به آنجا منتقل شدند و جمعیت اردوگاه تقریباً به دوهزار نفر رسید. از تمام وعده‌هایی که به پناهجویان دادند، فقط این عملی شد که بار دیگر به اردوگاه سر زدند. اکنون یک‌سال و نیم از این دیدار می‌گذرد، ولی تا به حال هیچ پاسخی به پناهجویان نداده‌اند. اخیراً هم قرار است اردوگاه الولید بسته شود، به همین خاطر از یکم ماه مه همه کردها در اردوگاه الولید دست به تحصن در برابر دفتر یو.ان زده‌اند. هدف از این تحصن و اعتصاب پایان دادن به سکوتی است که یو.ان در پیش گرفته است. می‌خواهیم به آوارگی سی‌ساله و زندگی زیر چادرها خاتمه دهیم و از این بیابان پر از گرد و خاک و آفتاب سوزان نجات پیدا کنیم. خواستار شروع زندگی تازه‌ای هستیم که در آن کودکان‌مان بتوانند به مدرسه بروند. چندماه پیش از تحصن ما، آقای محمد خالد نماینده یو.ان در غرب عراق گفت که آنها از طریق نامه رسمی حکومت عراق مطلع شده‌اند که تا اواخر ماه ژوئن این اردوگاه بسته شود. در چند روز اخیر اما حسن تمیمی مشاور حقوقی یو.ان به اردوگاه الولید سر زد و به‌طور رسمی اعلام کرد که سازمان‌شان به شیوه مکتوب از سوی وزارت کشور مطلع شده است که حکومت عراق قصد تعطیلی دو اردوگاه را در عراق دارد؛ یکی اردوگاه اشرف و دیگری اردوگاه الولید. آقای تمیمی همچنین گفت، سازمان یو.ان از حکومت عراق خواسته است که فعلاً این اردوگاه تعطیل نشود و وقت بیشتری برای این کار در نظر گرفته شود. وی گفت تاکنون برای آنان مشخص نیست که مدت‌زمان تعیین شده را تمدید خواهند کرد یا کماکان بر تصمیم خود مبنی بر تعطیلی نهایی پافشاری می‌کنند. این موضوع باعث نگرانی ما شده و حسن تمیمی تاکید کرد که پناهجویان باید خود را برای همه احتمالات پیش رو آماده کنند. جنگ هشت‌ساله ایران و عراق و حمله جمهوری اسلامی به کردستان باعث آوارگی هزاران کرد ایرانی شد و بیشتر آنان به کردستان عراق پناه آوردند. پس از آن حکومت بعث به اجبار آنان را روانه اردوگاه التاش کرد که در شهر رمادی مرکز استان انبار واقع شده است. این پناهجویان تا سقوط صدام حسین و حمله نیروهای آمریکا به عراق در این مکان سکونت داشتند و پس از آن چندین تن از آنان ترور شدند. بعضی از این افراد به‌طور آشکارا از سوی گروه‌های تندرو مانند القاعده، و تعداد دیگر به طور مخفیانه- که احتمالاً عوامل جمهوری اسلامی در آن دخیل بودند- ترور شدند. به دنبال این واقعه تعدادی از آنان به مرزهای اردن و کردستان عراق روی آورند. ماهم به مرزهای اردن رفتیم و حکومت اردن به ما اجازه نداد به خاک آن کشور وارد شویم و تا سال ۲۰۰۹ در مرزهای عراق و اردن ماندیم. سپس از سوی وزارت کشور عراق به اردوگاه الولید منتقل شدیم. اردوگاه الولید در بیابان و مردم آن هفت سال است زیر چادر زندگی می‌کنند. نزدیک‌ترین شهر به آن شهر الرطبه است که دو ساعت از الولید فاصله دارد اگر با ماشین مسیر را طی کنی. کودکان در مرزهای اردن و سوریه سال‌های زیادی از تحصیل محروم بودند و مدرسه‌ای که در اردوگاه وجود دارد آنان را نمی‌پذیرد. در این مدرسه تحصیل به زبان عربی است و تعداد انگشت شماری از کودکان می‌توانند درس بخوانند. البته مدرسه هیچ مدرک رسمی هم به آنان نمی‌دهد. سن اکثر آنان بالا رفته و از تحصیل محروم هستند. در روز ۲۵ مه دو زن کرد پناهجو دست به اعتصاب غذا زده بودند و روز ۲۰ ژوئن روز جهانی پناهجویان به نشان اعتراض به سکوت یو.ان و فشارهای حکومت عراق، در ورودی اردوگاه را بستیم و اجازه ندادیم خودرو کارمند یو.ان وارد اردوگاه شود. خواستیم به آنان بگوئیم ۵۰ روز از اعتصاب و تحصن کردها در این بیابان می‌گذرد و هنوز جوابی نداده‌اید. پزشک اردوگاه گفته بود این دو زن نمی‌توانند به اعتصاب‌شان ادامه بدهد. نماینده یو.ان به جای حل مشکلات آنان، شماری از نیروهای پلیس عراق را با خود آورد و می‌خواست به اعتصاب این دو زن پایان دهد و پناهجویان از اعتصاب و تحصن روزانه خود دست بردارند. این دو زن را به اجبار با آمبولانس به شهر الرطبه منتقل کردند و به اعتصاب آنان پایان دادند. پس از آن افراد اردوگاه از سوی نیروهای دولتی مورد بی‌حرمتی و حمله واقع شدند. قبلا مسئولان سازمان یو.ان بهانه می‌آورد و می‌گفت اردوگاهی که شما در آن سکونت دارید اردوگاهی رسمی نیست و سازمان‌شان به این اردوگاه دسترسی ندارد. پس از انتقال‌مان به الولید می‌گویند ما چندین‌بار با کشورهای مختلف گفت‌وگو کردیم و از آنان خواسته‌ایم که پناهجویان کرد را بپذیرند. تاکنون دلیل مشخصی برای ماندن ما کردها در این اردوگاه‌ها وجود ندارد. خوشبختانه ۹۹ درصد از فلسطینی‌ها به آمریکا منتقل شده‌اند و تقریباً ۲۰۰ نفری از آنان باقی مانده است. در پیوند با وضعیت این پناهجویان به سراغ هیئت حقوق بشر مجلس عراق می‌روم و با اسامه جمیل، عضو این هیئت گفت‌وگویی کوتاه کرده‌ام. حکومت عراق هم اکنون در نظر دارد مشکلات همه شهروندان ایرانی و ترکیه‌ای ساکن عراق را حل کند. اگر اردوگاه الولید بسته شود حتماً در شرایطی انسانی خواهد بود و رضایت آنان جلب می‌شود. این طور نیست که به اجبار به کشورهای خودشان بازگردانده شوند و یا به‌طور غیر انسانی با آنان رفتار شود. زیرا نه مجلس عراق و نه دیگر نهادهای عراقی این مسئله را قبول می‌کنند. در نهایت یا به کشوری منتقل خواهند شد که خودشان می‌خواهند یا این‌که اگر بخواهند در عراق بمانند حکومت عراق در تصمیم خود تجدید نظر خواهد کرد و در عراق می‌مانند تا تحولاتی در کشورهای خودشان صورت بگیرد. اینها بیشتر اظهار نظرات سیاسی هستند و تصمیمی قطعی در این زمینه گرفته نشده است. تعطیلی این اردوگاه‌ها کار آسانی نیست. حکومت عراق تا این حد تنگ نظر نیست. تاکید من بر بعد انسانی این مسئله است نه سیاسی. از لحاظ انسانی لازم است به شیوه‌ای با آنان برخورد شود که با اصول و مبانی حقوق بشر مغایرتی نداشته باشد. این موضوع به خاطر اهمیتی که دارد، در مجلس عراق مورد بررسی قرار می‌گیرد. مجلس عراق هم حتماً بعد انسانی را در نظر خواهد گرفت و به زیان هیچ فردی تصمیمی اتخاذ نمی‌کند. به نظرم این اردوگاه‌ها بسته نخواهند شد. زیرا در این صورت فشارهای نهادهای بین‌المللی حقوق بشر و جامعه جهانی هم وجود دارد. باید راه حلی در پیش گرفت که رضایت افراد این اردوگاه‌ها جلب شود. مردم عراق و حکومت این اردوگاه‌ها را به نوعی نادیده می‌گیرند. طبیعی است اگر همه مردمان عراق و یا محافل سیاسی از این موضوع مطلع نباشند. مردم عراق می گویند اعضای سازمان مجاهدین خلق در سرکوب مردم کردستان و دیگر نقاط عراق در سال ۱۹۹۱ دست داشته‌اند. این موضوع باعث شده نگاهی منفی به موضوع مجاهدین خلق داشته باشند و رویدادهای مربوط به آنان را نادیده بگیرند. دلایل و مدرک لازم وجود دارد که آنان در سرکوب تظاهرات سال ۱۹۹۱ کردستان نقش داشته‌اند و بسیار جای تاسف است. به همین خاطر اگر بی‌توجهی به رویدادهای مربوط به آنان وجود دارد جوابی است به اعمال و رفتاری که در سال ۱۹۹۱ در قبال مردم عراق داشته‌اند. ولی اردوگاه الولید در سرکوب مردم عراق دست نداشته است. اردوگاه الولید با اردوگاه اشرف فرق دارد و به تازگی نامه آنان به دست من رسیده و به هیئت حقوق بشر مجلس فرستاده‌ام و در روزهای آینده مورد بررسی قرار می‌گیرد و ریاست مجلس با حکومت عراق این موضوع را در میان می‌گذارد تا راه حلی که به نفع آنان باشد، پیدا شود. یکی از راه‌ها این است که نماینده‌ای از طرف ما به اردوگاه الولید سر بزند و خواسته‌های‌شان را با وی مطرح کنند و مشخص شود که خواستار انتقال به کشور سوم هستند یا می خواهند در کردستان عراق بمانند. من اطلاعی در این زمینه ندارم، ولی از خودشان شنیده‌ام. در جلسه هیئت حقوق بشر مجلس این موضوع را مطرح خواهیم کرد و افرادی که به آنان حمله کرده‌اند به مجلس فرا می‌خوانیم و باید توضیحات لازم را بدهند.